The story starts with a moment of boredom. Out of curiosity I used Google reverse image search to see where my images might or might not appear on the web. I randomly selected a few of my motorcycle images and started searching. The first tries brought nothing exciting. Either the images were only on lumenatic.com (where they are supposed to be) or on some other website I already knew of. For example, a blogger from the United Arab Emirates once reblogged my Ferrari FF shoot. He copy/pasted my complete article and put ot on his website. He should have asked, but since he credited the source and it was his private website I did not mind. Then I searched for this image, which is one of my favourite studio images. And – surprise ! – the image showed up on the website of a big European motorcycle magazine. 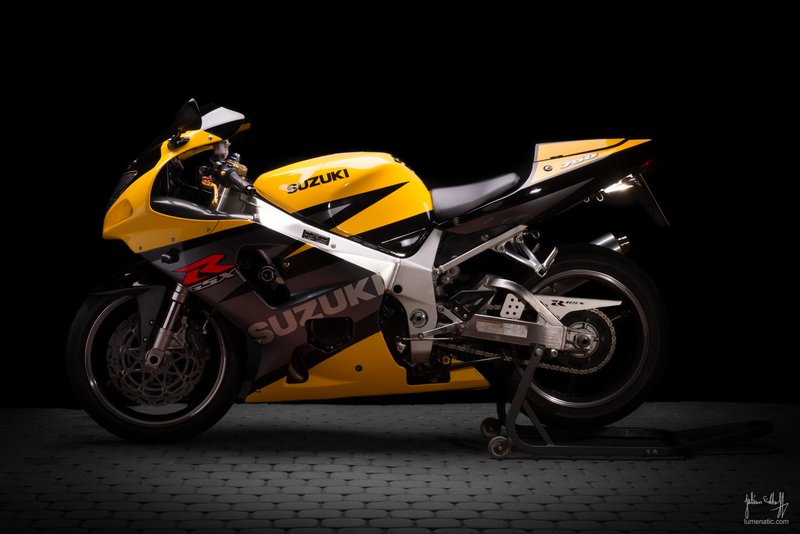 They had posted a long article about the history of the Suzuki GSX-R and included this photo. And if using it without asking was not enough, they even cropped the image to remove my watermark. Now that was another thing. A commercial website, stealing my image, even modifying it to conceal the theft… that made me angry. At first I secured evicende. I made a screenshot of the article, saved the article and image URL, even made a screencast navigating to the article and, to rule out somebody claiming I photoshopped my image on a screenshot to rip them off, even made a DSLR video of me sitting in front of the computer, navigating to the website. Then I wrote a polite, yet firm and crystal clear letter and included an invoice (I scrambled all information which could identify the website or the coutry of origin since we finally reached an agreement). I sent that letter, together with an invoice and a paper print of the image, to the editor-in-chief of the magazine (whom I found via the imprint on their website). Additionally I sent the documents as pdf via email. The first reaction was noticable just an hour after I sent the email. My image had disappeared from the artice. Good thing I had those screenshots. But they did not pay attention – the image still appeared as a thumbnail on their galleries. if they would have known the image was copyrighted, they wouldn’t have used it. I politely replied, that the time the image had been used is not the point of discussion. The image had been used without authorization. 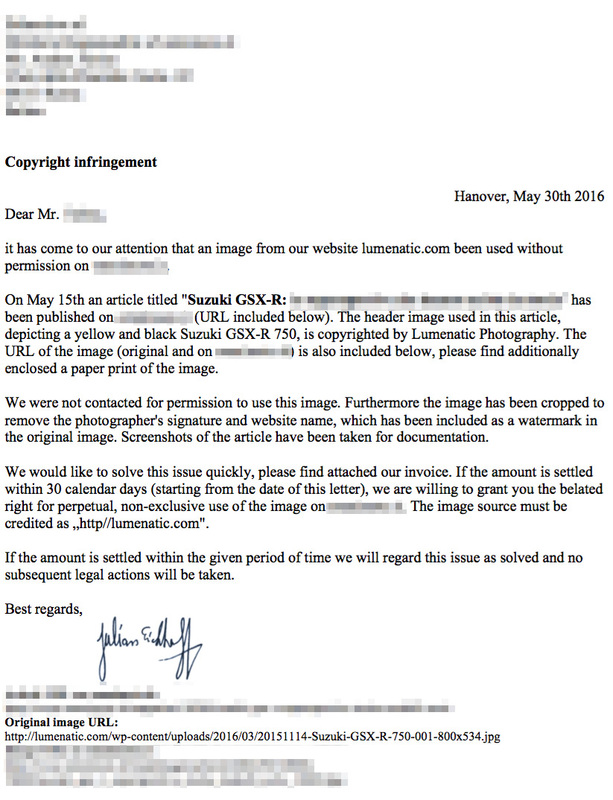 And the argument “we did not know it was copyrighted” is ridiculous: Firstly every image is copyrighted by default unless stated otherwise, and secondly my watermark was removed, so the theft was made with full intent (I did not use the word “theft” in the correspondence). you could give us an interview, that would be good publicity for you. Please, no! I thought that only happened to other people. He really claimed he did not have the money (I won’t share the exact amount). And he basically tried to solve it with giving credit and visibility. I politely declined and pointed out the size of the website and their reputation. They are not a nobody in motorsports on the internet, they are the no. 1 source of information in their country. And multiple websites belong to that group. When you navigate to the site you are clubbed to death by ads, banners and popups. If the payment of X hundred Euros would kill them financally they would not have gotten where they are now. As he now had understood that I would not step back from the invoice he tried another thing. Budget is so tight, times are tough running a website, we really can’t afford it. That’s where I gave in a little (don’t ask why, I just did it) and offered them a discount. Looking back I regret this step, because immediately after I gave in he again tried to force me into that interview thing and avoid any payment. But I made it clear that this was my last word. He still had a few days to go and I set a deadline. No payment until day X, and I would take legal actions. I received a slightly grumpy reply that he would now cut the responsible author’s salary to get the money for me (I would call that emotional blackmailing and I did not respond). Shortly before the deadline he requested an updated invoice and I sent it. A few days after the deadline the money arrived on my account. I was travelling and could not check my account balance during these days, so the slight delay is ok. Issue resolved. Image theft is not to be taken lightly. And as one can see at my example, it is also not taken lightly by those who infringed the copyright once confronted with the facts. I am happy that I could resolve this without a lawyer, as this step involved a financial risk for oneself.